Posted in Appetizers, Salads, Vegetarian, on May 21st, 2017. How many superlatives can I use here – oh my, fantastic, off the charts, amazing, is it possible, so good! The other day I was looking through my to-try recipes for a salad to take to a function. I paused at this recipe I’d downloaded some time ago. I read it through. So easy. Could it really be that good? It doesn’t LOOK all that wonderful – kind of bland looking, really. And considering the ingredients (saltine crackers, tomatoes, green onions, hard boiled egg, mayo, salt and pepper) you might wonder. So I went to Paula Deen’s webpage and there is a video clip of her making this, with her son. She talked about its origins (Albany, Georgia) and that occasionally they feature this at the salad bar at their restaurant. BUT – the reservation here is that it MUST be eaten immediately after you toss it together. Well, I could do that. All you have to do it chop up some fresh tomatoes (use good tasting ones, please) and chop up some green onions. Oh, and make 1-2 hard boiled eggs. And scoop out some mayo to add at the end. And crush a sleeve of saltine crackers (do it while it’s still in the paper sleeve). Nothing about this is hard. I had this all figured out in about 2 minutes. As I write this I haven’t taken it to the luncheon yet, but since I bought the ingredients, I just bought more and served it for a dinner I did here at home with friends. OMGosh! This salad is just so crazy good. I made one recipe (using one sleeve of saltine crackers), one heirloom tomato, 2 hard boiled eggs, 3 green onions (using most of the tops too), pepper, maybe some salt, and the last thing you do is add the mayo. Have everything all ready ahead – I’d chopped the tomatoes and green onions, plopped the eggs in on top and just let that sit. I’d also put out about the amount of mayo I thought it needed and at the very last second it got tossed. I served it as a side salad. 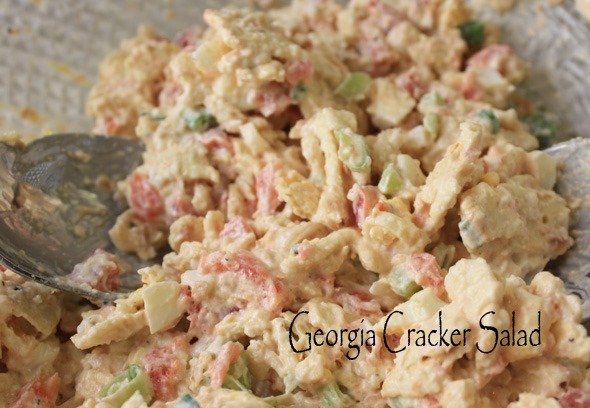 Paula Deen says where this recipe is from it’s served as an appetizer (or light lunch) with cold shrimp all around it. I think this would be hard to eat as an appetizer unless you served it with small plates and forks to eat it. When I made it, I used about a cup of mayo. The recipe called for 1 1/2 cups, and I noticed in the video they added more as it was needed, and they may not have used a full portion either. I’d start with 1 cup and only add more if you think it really needs it. When I take this salad to my function, I’m going to add a couple more chopped eggs on top (sliced, that is) instead of shrimp. What it will look like is a potato salad. But definitely it’s NOT! I can’t wait to make this again! What’s GOOD: every single solitary smidgen of this is delicious. Worth making. Don’t eat a lot of it, then you won’t feel guilty for all the fat grams you’re eating. I’ll definitely be making this again soon. What’s NOT: nothing other than the calories! 1. In a medium sized bowl combine the chopped tomatoes, green onions (use most of the dark green tops too as they add nice color), and the hard boiled egg(s). Grate in some pepper. 2. Crush the saltines in the sleeve until they are coarse pieces. Don’t overdo it – it’s nice to have a few larger pieces. Add it to the bowl, then add only enough mayo to make it moist – toss it well, then taste as you go. It may need another tablespoon or two of mayo. Mix well and serve immediately. Do NOT let it sit as it gets soggy. SERVING: scoop into a bowl just slightly bigger than the salad. Serve as a side salad or with cold shrimp it would make a lunch serving. Per Serving: 369 Calories; 35g Fat (81.0% calories from fat); 4g Protein; 14g Carbohydrate; 1g Dietary Fiber; 84mg Cholesterol; 442mg Sodium. Being a senior citizen and retired there always seems to be a potluck to make for and go to. When finding this as a single person seems to be inexpensive and feed a lot. Thank you for your blog which I truly enjoy and get new ideas.